Sheriff Tim Cameron and the men and women of the St. Mary’s County Sheriff’s Office today solemnly mark the two-year anniversary of the passing of Nolan Ray Scully, who died on Feb. 4, 2017, at the age of 4. Born in Leonardtown to parents Ruth Rebecca Rogers Scully and Jonathan Patrick Sully, Nolan bravely fought a rare soft-tissue cancer for a year and a half. Nolan loved firefighters, police and all emergency first-responders. “Nolan Ray was a fierce Protector, especially to his Mommy,” his 2017 obituary said. “It was no surprise when he became adamant that he wanted nothing more than to be a ‘policeman’ and he became just that being sworn in for the first time” by the Philadelphia Police Commissioner. “Nolan Ray wanted to be a one-of-a-kind policeman,” his obituary said. 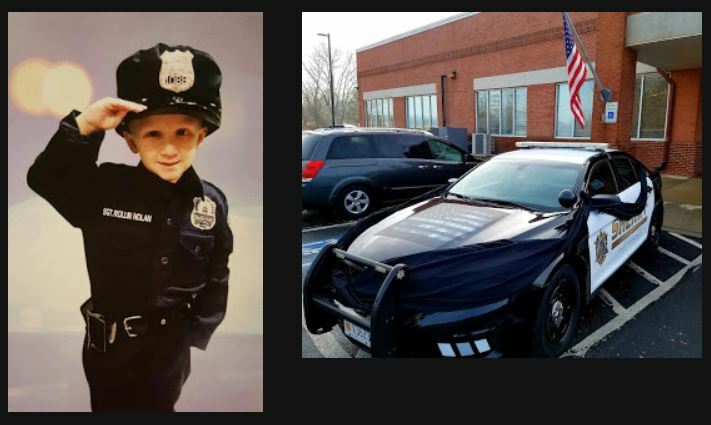 Not only was Nolan made an honorary sergeant by the St. Mary’s County Sheriff’s Office, but an active patrol cruiser was also decorated after him. That cruiser is parked front and center of the Sheriff’s Office headquarters this week. Last year, the St. Mary’s County Sheriff’s Office established an annual award for noncommissioned officers. The Sgt. Nolan Scully Memorial NCO Award is presented to a sworn sergeant who possesses a selfless and fearless leadership style and consistently displays the attributes of a problem solver, motivator and mentor to their subordinates. “Nolan’s courage and bravery in battling cancer set an example to us all when we think we’re going through challenges in our own lives,” Sheriff Cameron said. “Despite his battle with cancer, Nolan never lost his innocence, happiness, and love for his family and never lost his desire to help those in the community in their time of need when he got older. Nolan would have made a fine addition to the ranks of the St. Mary’s County Sheriff’s Office, but his spirit will live on so long as we remember his example,” Cameron said. In May 2018, Sgt. Robert C. Merritt was the first member of the Sheriff’s Office to be bestowed with the Sgt. Rollin Nolan Scully Memorial NCO Award for his professional excellence. This entry was posted on February 4, 2019 at 2:45 pm and is filed under All News, Community, County, Fire & Rescue, Law Enforcement, More News, St. Mary's News, z 600X120 Top Ad Bottom, z 600X120 Top Ad Top. You can follow any responses to this entry through the RSS 2.0 feed. Courageous little boy who will never be forgotten.